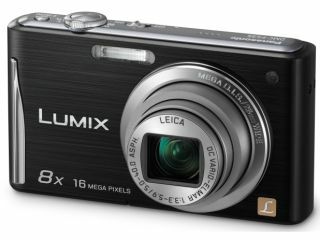 Panasonic has unveiled the latest additions to its Lumix digital camera line-up, including updates to the S-Series and FS-Series of snappers. The FS-Series is the more exciting of the two, featuring lenses from photographers' favourite, Leica. The FS16 and FS35 which tote the special 28mm wide-angle lens also offer a 16.1 megapixel sensor and 8x optical zoom. Because no camera is complete without the ability to shoot 720p HD video, both models can and they even have a special easy-to-hold grip for the butter-fingered photographer. With slightly fewer high-spec credentials, the S-Series has two new additions. The DMC-S3 offers 14.1 megapixels while the DMC-S1 in the shallower end of the megapixel pool with 12.1. Both cameras have a 28mm wide-angle lens, 4x optical zoom and the ability to shoot 720p HD video. Intelligent Auto mode offers help to less confident photographers, with automatic formats like image stabilisation, face detection, scene selectors and intelligent ISO control. Budding photographers will have to wait to get their hands on either range, however, as UK pricing and a UK release date are yet to be announced.